My PhD focusses on representations of regional English cities in contemporary theatre. As such, the main strand of my research is textual, looking at how dramatists and devisors alike have filtered the regional English city — both as space and communal identity — in order to present it on stage. Any analysis of contemporary theatre practice, therefore, necessitates an exploration of the context into which such work is made. Over the past couple of weeks, then, I have been doing some deep digging into some of the challenges and opportunities facing regional artists in today’s British theatre industry. I was keen that, as well as drawing on existing literature and discussion surrounding such issues, I also tried to look at some — slightly more objective — data. At first, I was hoping to get my hands on the figures behind the recent Arts Council England report Analysis of Theatre in England (BOP Consulting, 2016) but, currently, that has not been possible. Therefore, I decided to focus on a data set I knew I could get my hands on. Though the information available was partial — and I had to build much of it up myself — I reasoned that the importance of the Edinburgh Festival Fringe to the UK theatre ecology meant that it could serve as something of a thermometer to test out how the volume of work taking place outside London. The past few years has seen the emergence of a number of programmes which have sought to use the Edinburgh Fringe as a fulcrum to lift some of the dominance of what is an overwhelmingly London-centric industry. Programmes such as Northern Stage @ Summerhall and Escalator East to Edinburgh have used the pulling power of Edinburgh to showcase artists from their respective regions. Thinking of it further, this became increasingly interesting to me, that with all the words that have been put to paper about the London-centric nature of the British theatre industry that much of the touring ecology revolves around three weeks not even just outside of the capital but north of the border itself. That such a high-profile recieving venue — and, for what its worth, a London one — carries out over 40% of its annual scouting at the Fringe perhaps suggests that London itself is not as important as we might imagine. So, I decided to do some research. Proper research. With an Excel spreadsheet and everything. To see how the Edinburgh Fringe — which came into existence primarily as a reaction to the metropolitan artistic elitism of the concurrent Edinburgh International Festival — lives up to those initial ideals. Handily for me, the Fringe Society website allows one to filter productions by a number of variables and pull them from the site as a spreadsheet. Even better, it designates the United Kingdom not as a whole but as its four constituent nations. As my main focus here was on theatre productions travelling up from England, all data is restricted to the theatre section of the programme and to English-originating companies. It’s worth saying also that, as all information is self-entered by Fringe participants, it is prone to some error. Where I have spotted this, I have aimed to correct but that is not to say some erronious data did not slip through. The data on cast sizes has been retrieved from a mixture of company websites and information available on Broadway Baby’s show listings. Again, where I have spotted this to be erroneous, I have edited and this points to the possibility of further errors in the data. In a number of places I have separated data relating to professional shows from that relating to amateur, student and school productions. My reason for doing so is that I am interested here in how the make-up of the Edinburgh Fringe impacts upon the UK’s touring ecology as a whole and companies which self-identify as professional are, naturally, those who are most likely to be thinking of giving their productions a touring life beyond the Fringe. Despite this, I hold that a company that has made the decision to identify themselves as professional on submitting details for their show are those most likely to look to tour on the festivals close. There has been much discussion over the artistic impacts of some of the material and logistical contexts of the Edinburgh Fringe. In 2008, Guardian critic Paul Arendt complained that ‘more than half the shows I saw this week were one-person plays or monologue collections’ (2008). It is safe to say that such a notion exists anecdotally across the Fringe too. My research, however, does not bear this out to be quite the epidemic Arendt suggests. While there are more one performer shows than any other singular cast size, such productions make up only 29% of total English theatre performances at the festival. Its worth noting, however, that this figure includes amateur companies including school groups and university societies who — as they are usually attending the Fringe for the experience itself, rather than to gain any longevity for the work — are usually able to people their productions in a way not possible to professional performers. 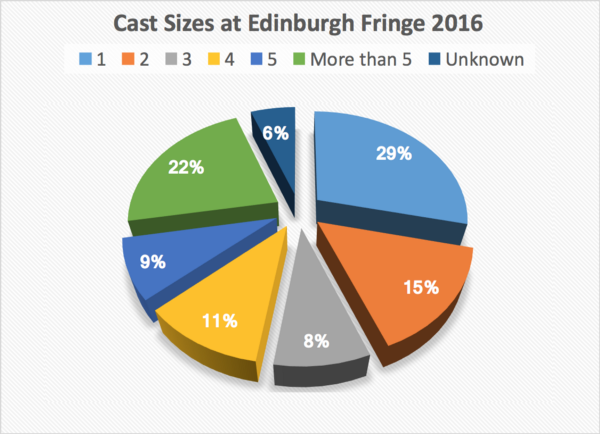 The figures become slightly more interesting when we extrapolate out solely the cast sizes of professional productions. As you can see to the left, when looking at just the data from professional shows, we see that 43% of these productions have a sole performer. Perhaps more interesting is by how much the volume of large cast productions shrinks. 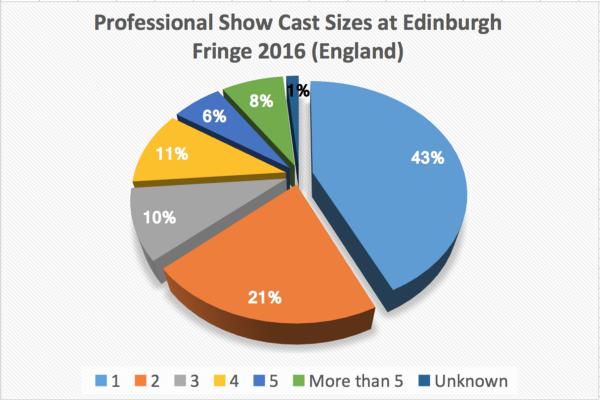 Where productions with more than two performers represented 66% of all productions above, when we examine the data referring solely to professional shows, they represent only 36%. In the small- to mid-scale I’d certainly suggest that such an argument holds true and so, again, I decided to crunch the numbers; this time, not so much to see whether it was true — it seemed fairly unlikely that shows under an hour were going to be in the minority — but to try and get a grasp on the extent of this hegemony. 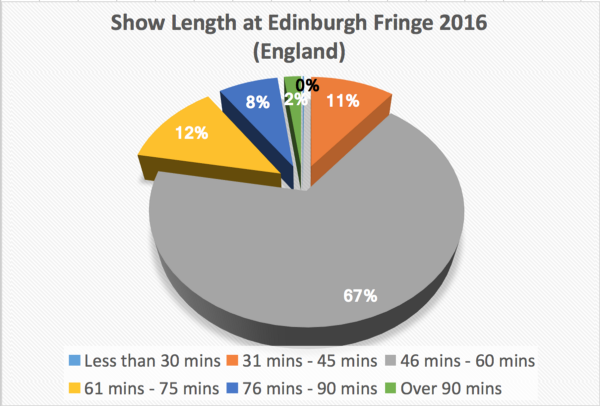 As we can see, shows between 46 and 60 minutes dominate at the festival, counting for 67% of the English contingent. Many venues in fact explicitly state that a show must below such a time period. But the area which my broader research drew me to was the origins of productions at the festival. As I mentioned above, the Edinburgh Festival Fringe began as a radically decentralising movement. 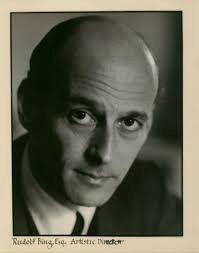 When Rudolf Bing announced the programme for the first Edinburgh International Festival in 1946 it ‘included the Vienna Philharmonic Orchestra conducted by Bruno Walter, […] the Louis Jouvet company from Paris in Moliere and Glyndebourne productions of Le nozze di Figarro and Macbeth’ (Forbes, 1997). Alongside this, however, was not a single representation of contemporary Scottish art. When six Scottish theatre companies — alongside two English groups — arranged their own venues and organised performances to coincide with the official programme from which they had been snubbed, then, it was a bold reaction against the metropolitan artistic elitism represented by Bing and Harvey Wood, the British Council head whom he worked alongside. The reason I began to dug into this data in the first place, therefore, was in order to see whether the festival holds up to that founding principle. If the importance with which Marmion grants it — a notion supported by the numbers of artists who flock their each year — holds true and it is indeed a vital entry point into the British theatre industry, to what extent does it support the entry of new voices or simply reaffirm the importance of existing ones? By using the data pulled from the Fringe Society website, I was able to further use company websites and social media pages to locate where each company travelling to the festival from England in 2016 is based. What I found was that 47% of all productions which travelled north across the border were from London-based companies. But this figure becomes even more startling when we remove those productions by non-professional groups. 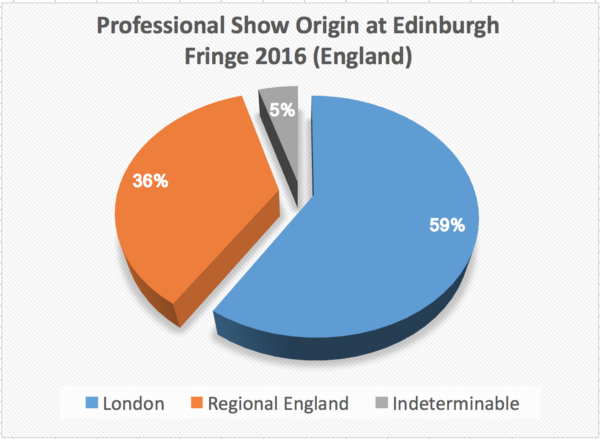 As you can see in the chart to the left, 59% of all English productions at the Edinburgh Festival Fringe 2016 were from London-based companies. 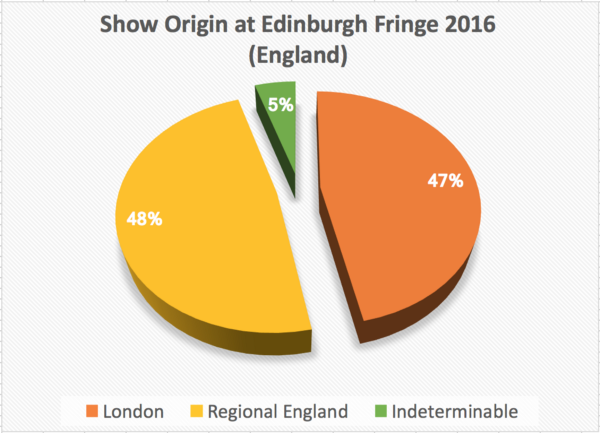 London in fact submits 29% of all productions at the festival, nearly twice the 15% which come from inside Scotland itself. The Edinburgh Fringe offers itself up as an anti-elitist, outsider of a festival. Yet, on examination of the data, we can see that such an image is not bourne out in reality. Of course, the complexity of the issue is that such a dominance of London-based companies at the Edinburgh Fringe both supports the same dominance across the UK touring circuit and is supported by it. The history of the Arts Council and — by extension — the arts in England is one of an unresolved tension between artistic excellence and artistic democracy but — even if action to rectify the inequities in funding and logistical support which overwhelmingly favour the capital was decided on — it seems that the complexities of such an issue would be hard to untangle in order to find a similar solution. 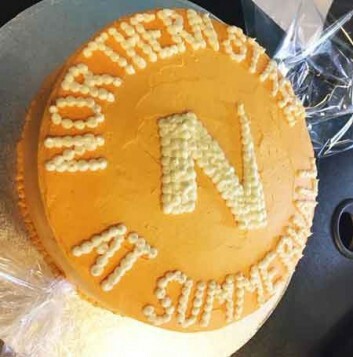 While there is clearly much positivity to be taken from programmes such as Northern Stage’s residency in the capital and projects such as Escalator East to Edinburgh, it remains to be seen whether the festival — which presents a huge opportunity for bypassing London’s gravitational pull — can ever deliver on such a promise. BOP Consulting (2016) Analysis of Theatre in England. Manchester: Arts Council England. Forbes, E. ‘Obiturary: Sir Rudolf Bing’. The Independent. [Online] http://www.independent.co.uk/news/people/obituary-sir-rudolf-bing-1237367.html [16 November 2016]. Gardner, L. (2016) ‘In theatre, amateur is not a dirty word’. The Guardian. [Online] https://www.theguardian.com/stage/theatreblog/2016/mar/15/in-theatre-amateur-is-not-a-dirty-word [21 November 2016]. Wilson, S. (2014) ‘IS THE EDINBURGH FESTIVAL FRINGE KILLING TOURING? — WHY THE WORLD’S LARGEST ARTS FESTIVAL MAY BE BAD FOR THE UK’S ARTS ECOLOGY’. House. [Online] http://housetheatre.org.uk/is-the-edinburgh-festival-fringe-killing-touring-why-the-worlds-largest-arts-festival-may-be-bad-for-the-uks-arts-ecology/ [21 November 2016].